One of Singapore’s leading cinema exhibitors, Golden Village Multiplex (GV) has opened the country’s first all-new laser projection multiplex at the new Singpost Centre retail mall, located in Paya Lebar. Now open to the public, the 756-seat multiplex debuts Barco’s Smart Laser Projection, which outperforms traditional digital projections and displays higher contrast, clearer imagery and higher colour saturation. A dual-screen projection showing the difference in image quality using Barco’s Smart Laser Projection (left) as compared to a traditional lamp-based projector (right). 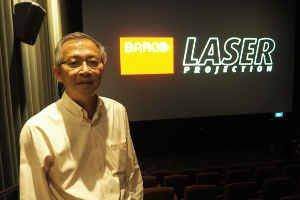 With the exception of the 3D cinema hall, all the cinema halls are using Barco’s DP2K-15CLP Smart Laser cinema projector, with 15,000 lumens and 30,000-hour constant brightness at typical usage conditions. The 3D cinema hall uses the Barco DP2K-20CLP, with 20,000 lumens and a native contrast ratio of up to 2,400:1. Ms. Clara Cheo, Chief Executive Officer of Golden Village Multiplex said, “The introduction of laser projection will be a game changer, not only for us, but for the industry at large. And with a specific focus on design and comfort, we want to create a more sophisticated experience for our customers. We’re confident that with so many firsts at Golden Village Paya Lebar, movie-goers will want to come out and have a great time at the movies with us”, she added. Barco’s General Manager SEA Eddie Tan.